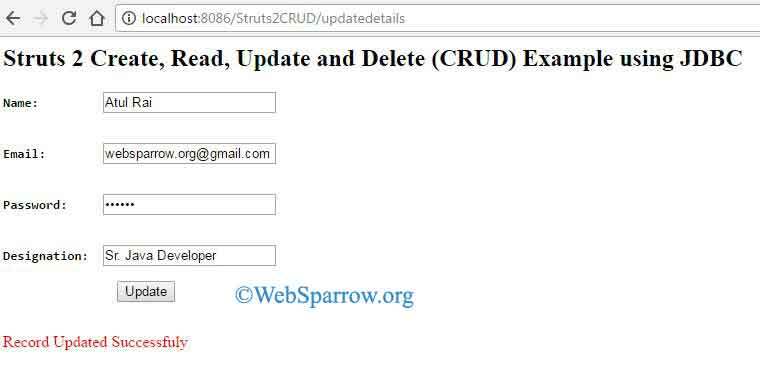 In this Struts 2 tutorial we will create a simple application for Create, Read, Update and Delete (CRUD) operation using JDBC. CRUD is the basic module that most of the project has. I have tried to make it simple as I can. Save the user data in the database. Retrieve all the stored data on JSP. Update the selected user data in the database(previous information must be visible to the user before the update). Delete the selected user data from the database. We need to create a table in our database to store the user information. 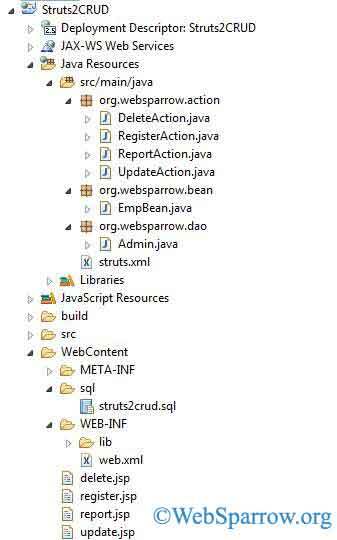 Before starting the code we need define struts 2 filters in web.xml. This class will communicate with the database. In this class I have created all the methods for connecting to the database, insert data into the database, fetch data from the database, etc. Create the getter and setters of parameters. We need to create the four action classes for every operation to make it simple. In this class, we get the user information and save into the database. If data inserted successfully display success message otherwise show the error message. This class will fetch all the stored data from database and display on JSP. If data is available in database display it else displays No Data Available. In this class, We will fetch the previous data from the database and update the new data in the database. Delete the select data from the database. Create the JSP pages that interact with the users. For more convenience, we have created the separate pages for every operation. On this page user will fill out all the information. This page display all the data that retrieved from the database. On this page, we will fetch the previous data of the selected row and update the new data into the database. Show the status if the selected record is deleted or not. Now everything is all set, deploy the project on your web server.